Mouse models of Zika infection in adults confirm that the virus can infect specific regions of the eye, resulting in uveitis and conjunctivitis--a symptom observed in 10%-15% of human patients. Furthermore, viral RNA was detected in rodents' tears after the virus had been cleared, raising the question of whether Zika continues to replicate in the lacrimal gland, where tears are produced, or the cornea, outside the reach of the immune system. Washington University School of Medicine researchers publish the findings September 6 in Cell Reports. "Additional human studies are still required to better understand all the implications of Zika virus infection of the eye, but animal models such as this are important in terms of showing what is possible and for testing new therapies," says co-senior author Rajendra Apte, an ophthalmologist and molecular biologist at the Washington University School of Medicine in St. Louis. 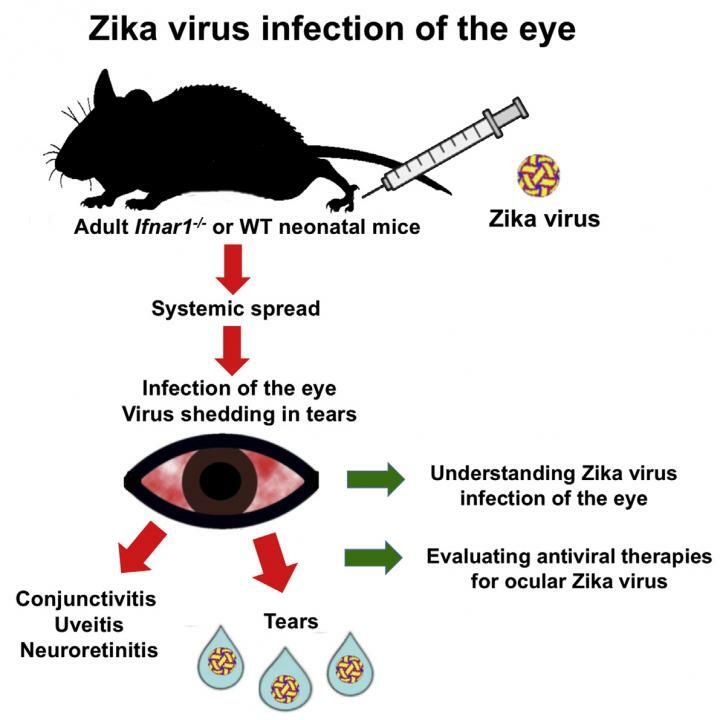 For this evaluation of how Zika virus affects eye function and anatomy in mice, he partnered with infectious disease specialist and virologist Michael Diamond, also at WUSTL, who has been a leader in generating mouse models for Zika during the ongoing epidemic (10.1016/j.chom.2016.03.010; 10.1016/j.cell.2016.05.008; 10.1016/j.cell.2016.07.020). In adult mice bred to be susceptible to Zika, any signs of eye disease appeared within 7 days after being injected with the virus. Mice developed conjunctivitis (commonly known as pinkeye), which has been seen in adult human patients infected with Zika, and inflammation of the uvea, where the iris and retina are located, as well as the optic nerve, which is rare in Zika-infected humans but has been reported. It is still unknown how the virus enters the eye. "Possible routes of ocular infection include transmission of the virus from the brain along the optic nerve and into the eye," Diamond says. "Alternatively, the virus may invade the eye by crossing the blood-retina barrier." Another possible route, known to be rare but possible for Ebola transmission, is to enter the surface of the eye via tears. The study did explore whether Zika could be infectious once in the eye. The researchers observed that viral RNA taken from inside a mouse eye 7 days after getting the virus could cause symptoms when injected into another rodent. This was not the case for viral RNA in tears 7 days after infection or from eye tissue 28 days after infection. The data suggest that the eyes may not produce infectious virus after the initial phase of infection. The presence of Zika RNA so long after the virus is cleared is concerning, however, because it could mean that corneal tissue, a common tissue for transplant procedures, could harbor the virus. Apte and Diamond's study did not find eye defects in newborn mice after Zika infection during pregnancy, which has been described in humans, but that doesn't mean Zika is not involved. Among the open questions that remain is whether the virus causes neurodevelopmental changes that lead to blindness and other serious eye diseases in children born infected with Zika.